So it has been a couple months since my last post, and I always say I am going to try to post more often so I won’t say it this time. However, in an effort to try to post more often, I am every so often going to try something new. In addition to what I normally write about, I am going to try to throw in the occasional posting of one of my favorite images that I have shot. This could be a wedding shot, or some random street shot… Just whatever I’m feeling that day. What I want to do, though, is give a little background story of how the photo came to be. Whether that be as a “how I did it” post or just a little story of my thoughts or feelings the day the shoot took place, will probably change depending on the chosen image. I know it may be common sense for a professional photographer to have backup equipment be a high priority on their must have list, but you would be surprised how many shoot events with only one camera… Even if they have more than one in their arsenal. All photographers will always say backups are a must. Not just for cameras but for memory cards, lenses, batteries, etc. Not one will say “you don’t really NEED a backup” even if they never have backups. However, even a casual shooter should have some kind of backup unless they are not worried about missing the photo opportunity due to broken / malfunctioning equipment. Now, I am not just writing about this topic to have something to write about. I have been photographing weddings, events, portraits, and more for about six years and not once have I had a major camera malfunction… Until a couple weeks ago. Not only did I have a camera failure, but it wasn’t at a lesser important job like a family portrait shoot, it was at a wedding! Talk about needing to remain calm and composed; this was the epitome of needing to stay calm. While at a wedding, right at the end of the ceremony (after the kiss thank god), my Canon 5D locked up and would not continue to shoot. No error message, no reasoning, just gave up. I always use two cameras simultaneously at weddings so I continued with the other until I had a chance to check out the issue. When I had a minute (and you rarely have that much time to stop at a wedding), I looked over my 5D and found that the mirror had detached itself and lodged into the lens track. I managed to get the lens off, get the mirror out, and secure all the pieces. Then finished the wedding with one camera. Everything the rest of the day went smooth, but my main concern was that I was leaving for an out of town job a day and a half later and kind of needed two cameras; that was what was nagging at me the rest of the day. I was racking my brain of what to do. Risk shooting with only one camera body, rent another body and cut into my profits, find a fellow photographer to borrow a body from? Luckily, my answer was simple. I had just upgraded my old Canon 20D to the newer 50D and sold the 20D to my parents who had wanted something better than a point and shoot. The wedding I was at was 3 hours from my house, but partially on the way to my parents house who lived 6 hours from me. I called them up and explained the situation, and they drove to meet me half way to deliver the old 20D. That camera body has been through a lot with me being my first professional camera so it was only fitting that it was the camera to save me. Now with sufficient backup, I felt a little more at ease leaving town for the job. Now, this situation played out and resulted in no major business repercussions. But needless to say, it could have been a lot worse. I have great parents, I have great colleagues, and I have a great camera system in Canon (who reattached the mirror at no charge). But not everyone has the same at their disposal. Which brings me back to the topic of saying ALWAYS HAVE BACKUP EQUIPMENT! No excuses… Always! The final verdict on the 5D camera body (which hasn’t come back from Canon yet) was not only the detached mirror but the shutter was way over it’s maximum shot count and had to be replaced. That could have been the reason for the mirror detaching. Until then, my old, trusty 20D is getting me through the jobs I have lined up currently. So, do I need to say it again? ALWAYS HAVE BACKUP EQUIPMENT! No excuses… Always! Just over one week until I get to fly halfway across the country to welcome a new Jones into the family and photograph my cousin’s wedding. The weather in the Midwest is looking to be quite adventurous, however, we will definitely come away with some fun imagery, rain or shine! 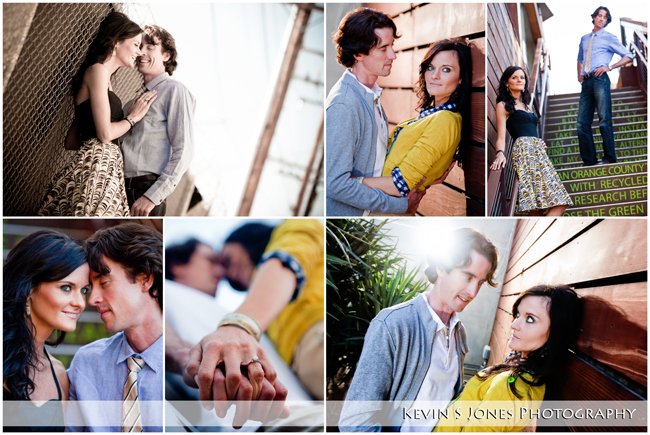 (preferably shine, of course) Here are some of the engagement portraits from Southern California that I shot a while back. I can’t wait for the big day!